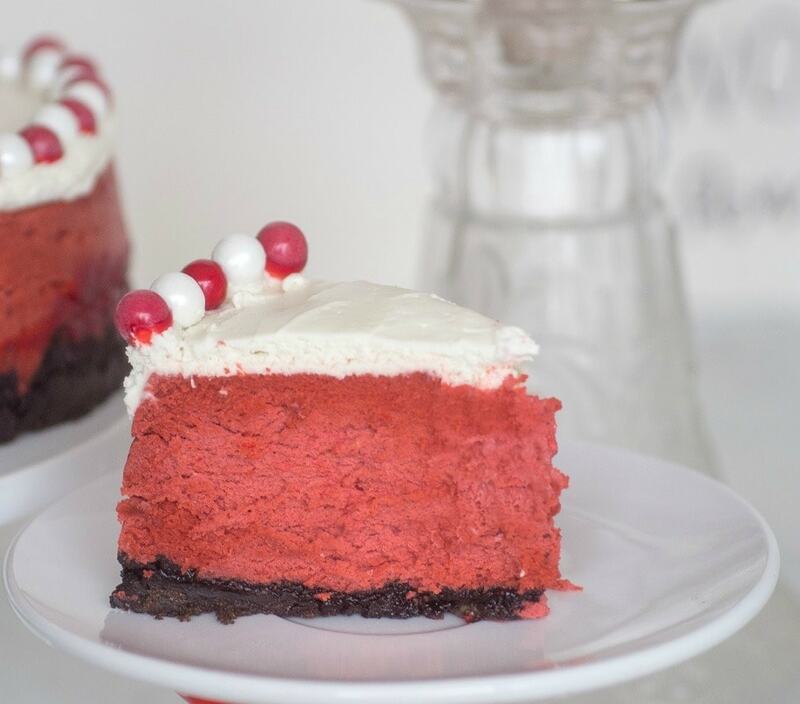 This Instant Pot Red Velvet Cheesecake is festive and tasty, making it perfect for serving for Christmas dinner or Valentine’s Day. The chocolate cookie crust with red velvet filling, topped off with a cream cheese frosting and chocolate candies. 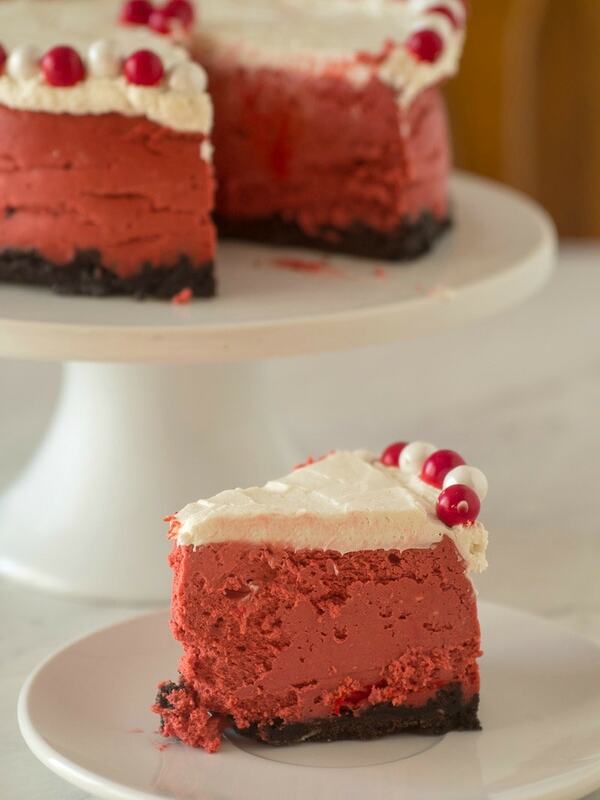 Red Velvet is one of the most popular cheesecake flavors because its subtle chocolate flavor goes perfectly with creamy cheese. This cheesecake is made in the Instant Pot for a dessert that is elegant and perfect for a special occasion. 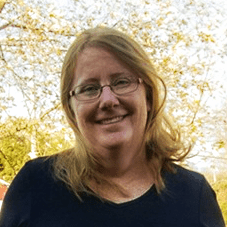 Although it seems like there are a lot of steps in the recipe it is relatively easy to make, and using the Instant Pot to cook the cheesecake makes it less likely the cheesecake will crack. 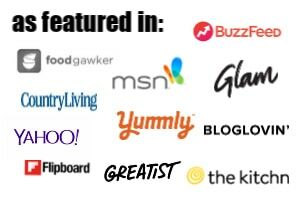 Why Make Cheesecake in the Instant Pot? It seems kind of strange at first, but an Instant Pot (or any pressure cooker) is actually ideal for baking cheesecake. Traditional cheesecake recipes call for using a pan of hot water under the cheesecake to serve as a hot water bath and steam the cheesecake. 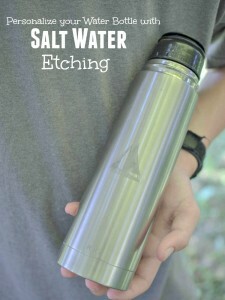 This helps make the cheesecake creamy and helps prevent the top of the cheesecake from cracking. In a pressure cooker you just need a some water on the bottom of the cooker to steam the cheesecake as it cooks. Do you Need Special Equipment for an Instant Pot Cheesecake? In order to make cheesecake in the Instant Pot the most important thing is a pan that will fit inside the Instant Pot. You can use a 7 inch springform pan, or a push bottom cheesecake pan. 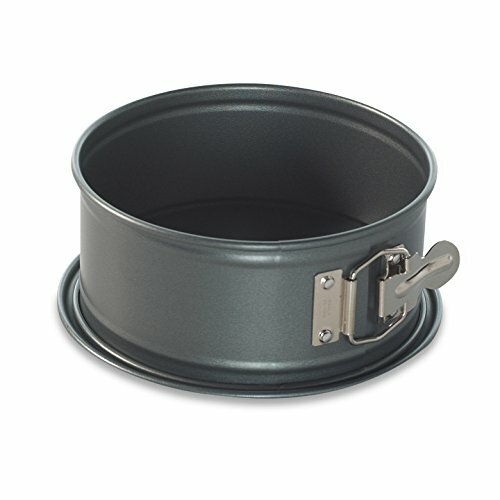 If you already own a standard size springform pan it will be too large for the pressure cooker. You can also use smaller 4 inch springform pans and stack two of them inside the Instant Pot. 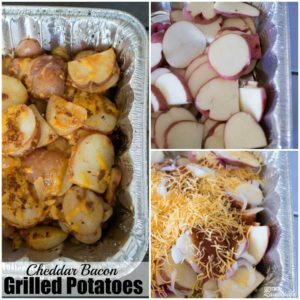 I made this recipe in a 7 inch pan so you’d need to make adjustments if you want to use a different size pan. Another issue with making any dessert in the Instant Pot is that the seal can absorb odors from cooking that are hard to get rid of. You can clean and deodorize the ring, which is a good thing to do periodically, but it is easiest just to have multiple rings. Then you can use one for cooking dinners like pork loin, and a different one for making desserts. 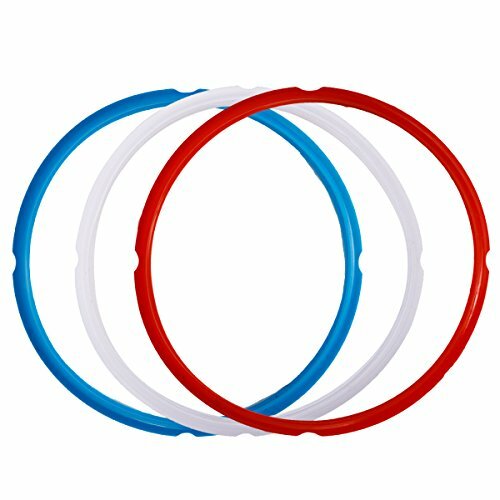 The multicolored rings you can buy make this easy to keep track of and eliminate worry about an unexpected chili flavored cheesecake. How is Red Velvet Different than Chocolate? Some recipes for red velvet simply add red food coloring to a chocolate. But traditionally red velvet is made by combining cocoa powder, vinegar and buttermilk, which is what I did in this recipe. 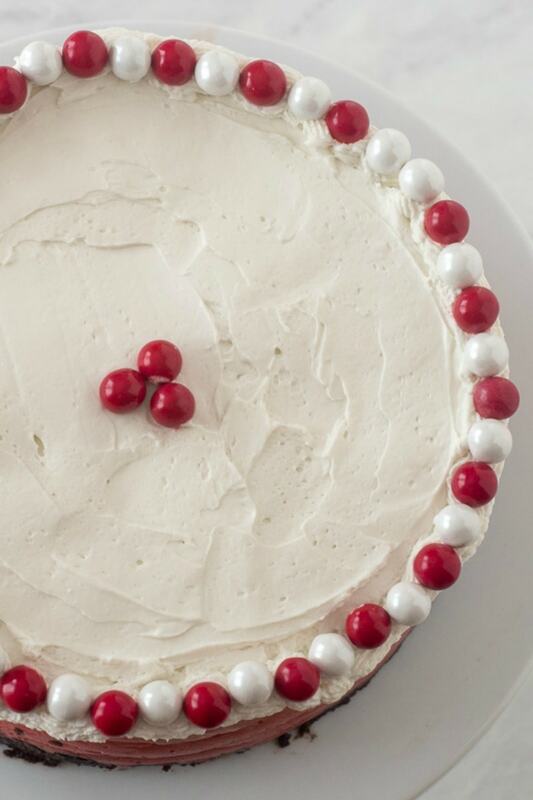 This makes the cake less chocolatey, but gives it the distinctive taste that characterizes red velvet. In red velvet the vinegar and buttermilk react with the cocoa to give the batter a red tint. I also used a bunch of food coloring to give it a deep red color, since otherwise the red tint is pretty subtle. The first step in making the cheesecake is to make the crust. I use Oreo cookies as the base for this crust and crush into small crumbs with my food processor. 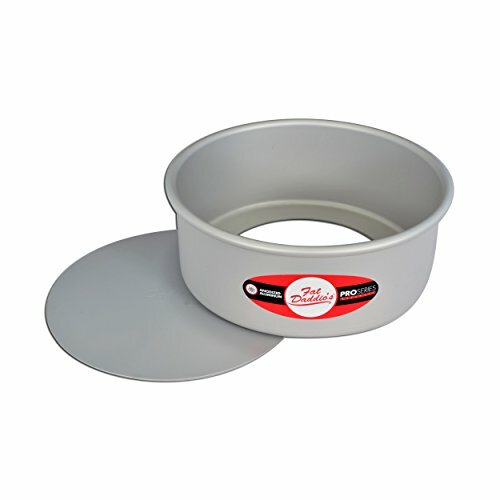 The Oreo cookie crumbs are then combined with melted butter and pressed into the bottom of the 7 inch springform pan. Almost any kind of cookie or graham cracker would work for this crust, but I like the extra chocolate flavor that comes from the Oreo cookies. 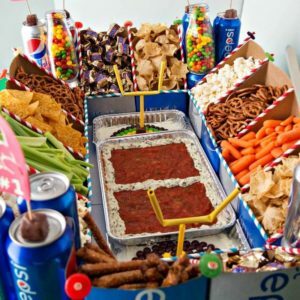 A fun change would be to use Red Velvet Oreos to make the crust! After the cookies are pressed into the pan I put it in the freezer to allow it to harden while I make the rest of the cheesecake. 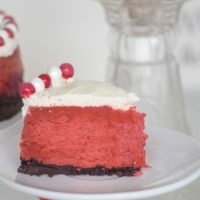 The cheesecake filling is a standard mixture of cream cheese, sugar, eggs and vanilla with the addition of the red velvet flavor ingredients of buttermilk, vinegar and cocoa. The key to making a creamy cheesecake is to make sure the ingredients are at room temperature when you start and not over mix the batter. Too much air in the batter can cause cracking. 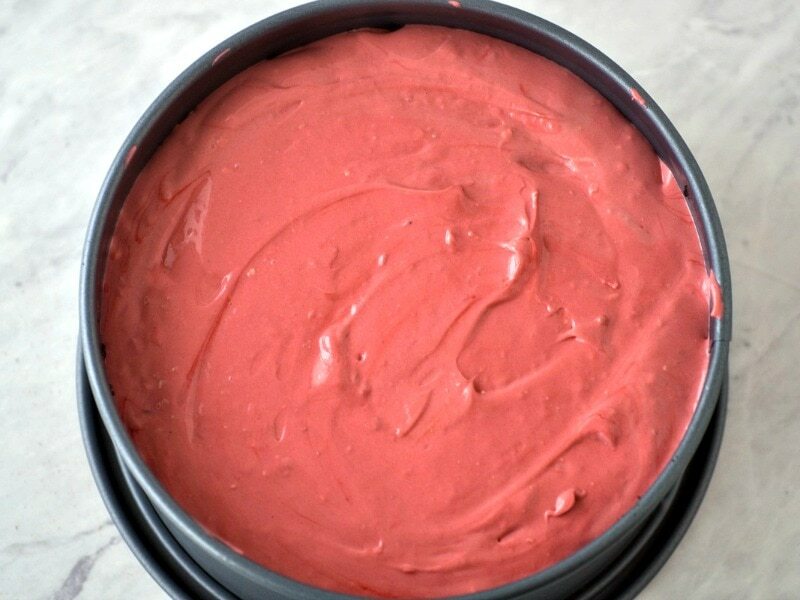 I used about 1/4 teaspoon of red paste food coloring to make the batter a nice deep red color. Once the cheesecake is ready to bake you need to do a few different things to make it easy to cook in the Instant Pot. First cover the cheesecake with foil so that the condensation from the steam doesn’t end up on top of the cake. 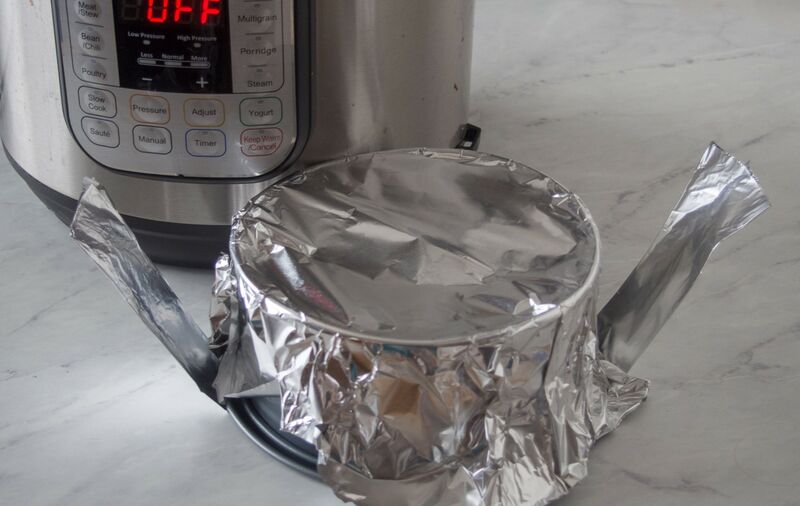 Then use foil to make a small sling that allows you to take the cheesecake in and out of the Instant Pot without tipping it. 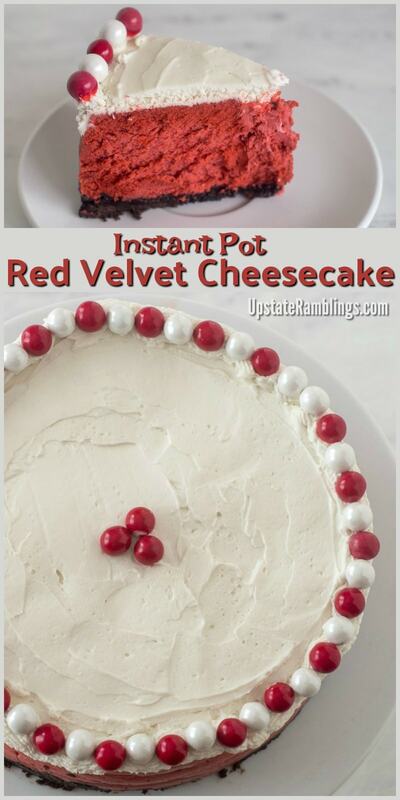 To cook the Instant Pot red velvet cheesecake you need to add about 1 1/2 cups of water to the pressure cooker and then add the trivet. Then use the foil sling to lower the cheesecake pan into the pot. This recipe is cooked on Manual setting at high pressure for 40 minutes, followed by a 10 minutes natural pressure release. Then the foil sling is used to lift the cheesecake out of the pressure cooker so it can cool to room temperature. After the cheesecake is chilled I like to add a simple cream cheese topping, made with cream cheese, sugar and whipping cream. 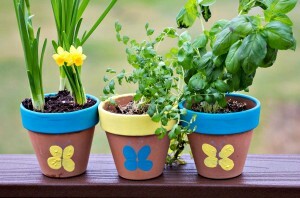 This a great way to hide any cracks that might occur despite your best efforts! 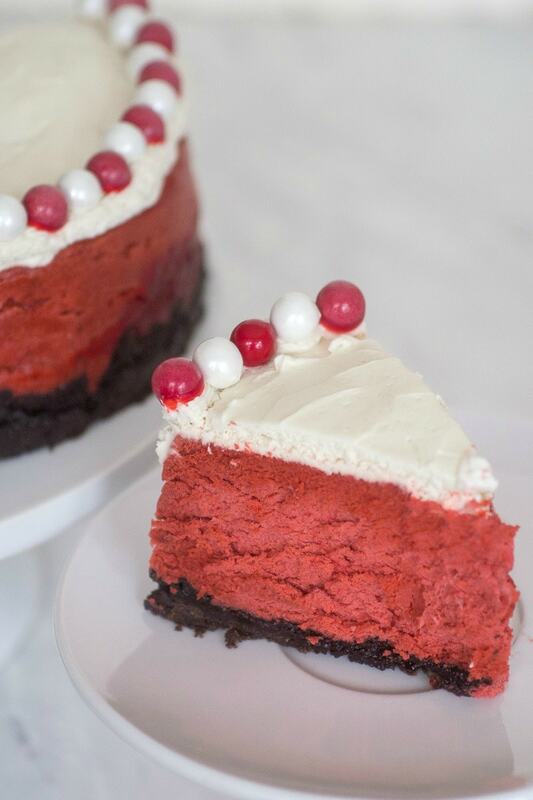 I also piped a ring of the topping around the edge of the red velvet cheesecake and decorated the edges with red and white sixlet candy to make the cake look festive for the season. Holiday colored M&Ms would also make a nice decoration. 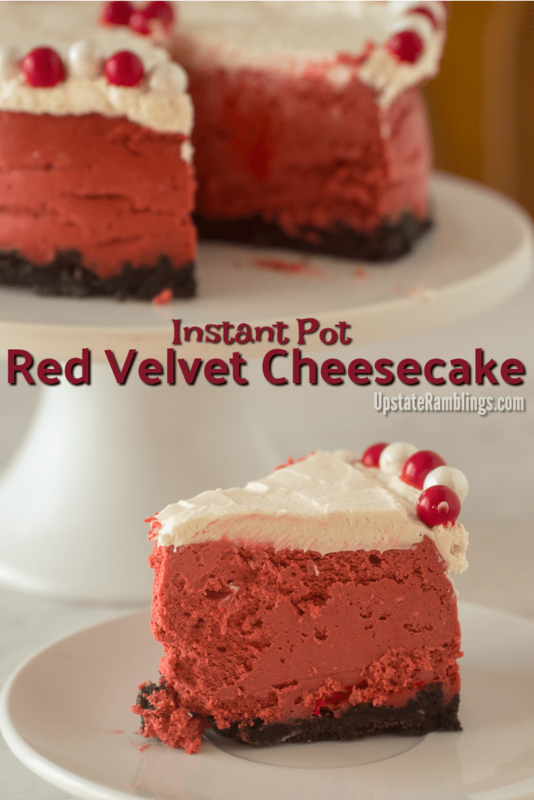 My Instant Pot red velvet cheesecake was light and creamy and tasted delicious. It was very rich, and I found that a small piece was plenty. In the recipe card I specified that it serves six, but I think it could easily be cut into slightly smaller pieces and serve eight. that would lower the calorie count too, but lets face it, cheesecake is a decadent, high calorie dessert! The cake has a mild chocolate flavor which contrasts nicely with the chocolate crust and the chocolate candies on top. 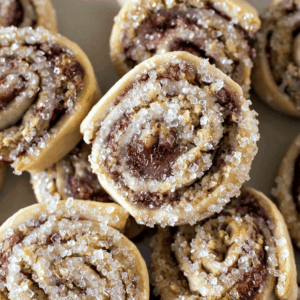 I served this as a Thanksgiving dessert, but it would also work for Christmas, Valentine’s Day or anytime you want a tasty dessert. Crush the Oreos in a food processor, processing until they are fine crumbs. Melt butter and mix with the cookie crumbs. 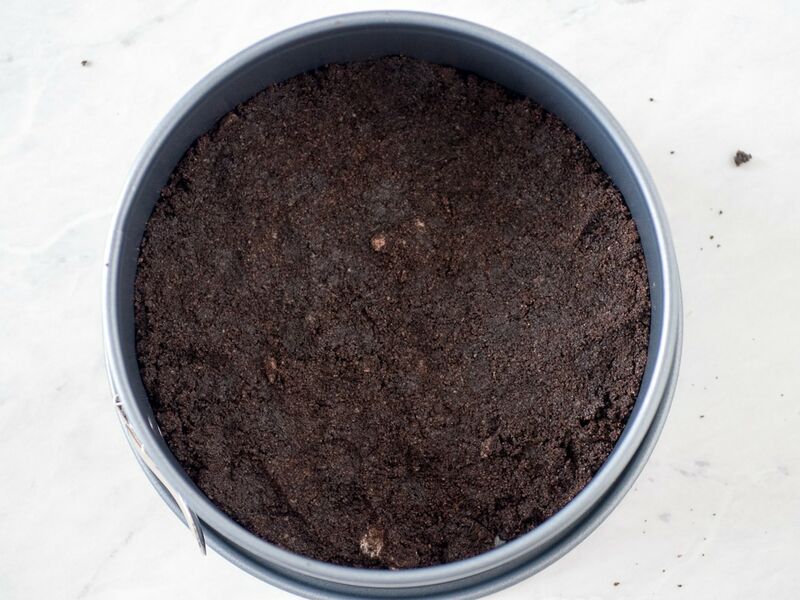 Press the cookie crumb mixture into a 7 inch spring form pan, covering the bottom. Put the prepared pan into the freezer while you make the filling. In a mixture beat the cream cheese until it is smooth. Add the sugar and mix until combined. Then add the eggs one at a time, mixing well and scraping the bowl in between each addition. Add the cocoa, buttermilk, vinegar and vanilla and mix until well combined. Stir in food coloring and mix well. Pour on top of the prepared crust. Pour 1 1/2 cups of water into the bottom of the Instant Pot, then add the trivet to the pot. Cover the spring form pan with foil. Then fold a long piece of foil lengthwise to make a sling that can be used to take the cheesecake in and out of the Instant Pot. Place the sling under the cheesecake pan and lower it onto the trivet. Put the lid on the instant pot and lock in place. Set the pot on Manual and cook the cheesecake at high pressure for 40 minutes. 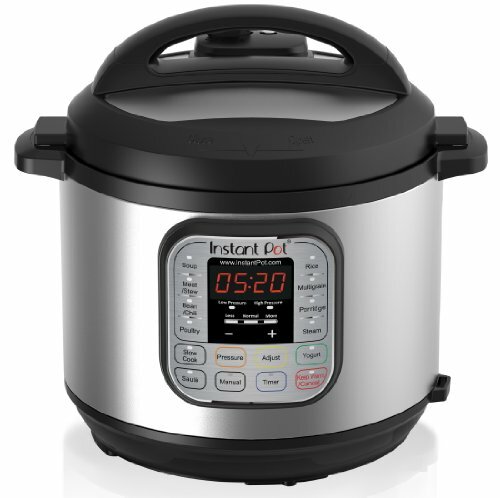 Once the Instant Pot beeps let it release pressure naturally for 10 minutes, then quickly release the rest of the pressure. Take the lid off and use the foil sling to carefully lift the cheesecake out of the Instant Pot. Take the foil off the top and let the cheesecake cool to room temperature. Refrigerate the cheesecake, still in the spring form pan. Remove the spring form pan after the cheesecake has been refrigerated for a few hours. After the cheesecake has been refrigerated for 8 hours or overnight make the topping and decorate the cheesecake. Add the sugar and mix until combined. then mix in the cream and beat until soft and fluffy. Spread the topping over the cheesecake, to the edges. Then fill a pastry bag and pipe topping around the edge of the cake. Finish by decorating with colored candies. I can’t stress enough how important it is to have the cream cheese at room temperate before making this cheesecake! Cold cream cheese will be lumpy and will not give you a smooth cheesecake batter. If you don’t have paste food coloring you can use liquid red food coloring. It will probably take most of a 1 oz bottle, but just keep adding food coloring until you get the color you want. I love red velvet! This cake looks so delicious! I bought the pan you linked and it is so nice too.